The current London based Crawdaddies was actually founded by Mark Freeman and Rod Stewart drummer Micky Waller in the early 2000s. During the early 1960s, Micky had played drums with one of the most impressive lists of celebrities from that era imaginable. Jeff Beck, The Rolling Stones, Long John Baldry, Georgie Fame, The Walker Brothers, Jimi Hendrix to name just a few! ‘Mark, Gigs are done and forgotten very quickly even if they may seem important at the time but records carry on for ever’. (Micky Waller). How right he was, probably Micky’s best known recordings are his drumming on the ‘Truth’ album with Jeff Beck and also playing drums on Rod Stewart’s Number ones ‘Maggie May’ and Micky’s favourite, ‘You Wear It Well’, but this is by no means an exhaustive list. Mark and Micky were introduced to each other by agent, the late George McFall at The Bull’s Head in Barnes, London. Mark had been playing drums since about 1968 and had enjoyed some success in that time having been featured playing drums on John Otway and Wild Willy Barrett’s ‘70s hit ‘Cor Baby That’s Really Free’ and an album and three singles with Les Payne’s ‘Mainland’ band who spent 3 months on the road supporting Leo Sayer in 1979. Most recently Mark had been playing drums in ‘Art Wood’s All Stars’ with fellow Crawdaddy Keith Grant and had also enjoyed a couple of guest appearances from Art’s brother Ronnie Wood during shows at Twickenham’s revived Eel Pie Club. At the time Micky and Mark were introduced, Mark had only recently started playing guitar and soon became a familiar face on the West London Jamming Scene. That evening Micky had been much enjoying the avails of the bar at The Bull’s Head and when George suggested that they might work together Mark and Micky made a pact that if Mark could accept Micky’s ‘appalling drunken behaviour’ and Micky could put up with Mark’s ‘appalling guitar playing’, they could set about forming a band! Thus the ‘Micky Waller’s All Stars’ was born and played their first show at The Eel Pie Club, Twickenham on December 2nd 2002 with guests Art Wood, Don Craine from ‘The Downliners Sect’, and many others. Micky Waller’s All Stars went on to play at The Bulls Head and Eel Pie Club quite regularly and often featuring interesting guests until Micky sadly and suddenly died on April 29th 2008. Micky’s band joined forces with the respective venues and put on memorial shows at both The Eel Pie Club and The Bull’s Head, with a much loved and acclaimed drummer Sam Kelly sensitively and ably standing in for Micky on drums. There was a general feeling in the band and with agents and promoters alike that the band had a charisma too good to throw away and that we could best honour Micky by continuing rather than stopping. Thus ‘The Crawdaddies’ were born. 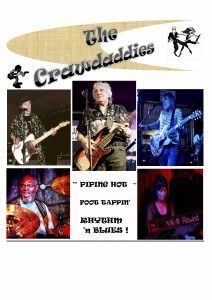 The aim of The Crawdaddies runs, in fact, very parallel to that of The Eel Pie Club in that we want to preserve the Mayem, Enjoyment and generally exciting ‘Foot Tapping’ vibe of 1960’s Rhythm ‘n Blues coupled with playing much cherished Rolling Stones Album Tracks and 60’s ‘B’ Sides as well as high octane, authentic Rhythm ‘n Blues and Rock ‘n Roll. Ideally, our friends should leave a Crawdaddies show feeling that they had just been to a good party!